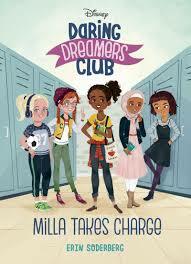 Milla Takes Charge (Daring Dreamers Club #1) is the first book in a new series about a group of fifth grade girls who get to know each other once they all find themselves in the same advisory group. The girls' passions and dreams are revealed through a writing assignment they complete for their teacher, Ms. Bancroft. Milla, who dreams of adventures and would love to attend the fifth grade overnight at Adventure Camp, is worried because her parents are overprotective. With the support of her friends, Milla decides to prove to her parents she is responsible. This series will be a great one to hand to younger middle grade readers who enjoy realistic fiction and stories about friends. Young readers will be able to relate to the story, there is a positive message, and the characters provide a model of friendship, showing how friends work together and support on another. The author's note at the end of the book gives information about Ann Bancroft, the first woman to cross the North Pole, who provided the inspiration for the fictional Ms. Bancroft. This book does not publish until June, but I am already looking forward to finding out more about the other girls in the Daring Dreamers Club, who will be featured in the next books in the series. Thanks to the author, Erin Soderberg, for sending my book review group, #BookExcursion, an advanced reader's copy of the book.